Sunday marks the first day of Recreational Stone Crab Season for the state of Florida! Annually, the season starts on Oct. 15 and runs through May 15. According to the Florida Fish and Wildlife Conservation Commission website, the recreational stone crabbing Size Limit is: 2 3/4 Inch Claws. and the Daily Bag Limit is: 1 gallon of claws per person or 2 gallons per vessel, whichever is less. The harvest of any egg-bearing crabs is prohibited. Although it is lawful to gather both claws, at the legal size, best practice suggests removing only one claw so, the crab has a means to defend itself and eat. The more energy the crab has, the faster it will molt to be able to grow its other claw back. 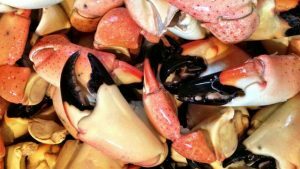 You can harvest stone crabs by a baited trap but there are several trapping regulations listed here. To see the proper way to harvest a claw by hand, view this video. Adventure Outfitters carries gloves and nets needed for all of your crabbing this season! We also offer several courses including a spearfishing course that teaches you size requirements and limits for Florida fish and techniques for catching them. To schedule a stone crabbing tour, please contact the shop at 813-832-6669 or at info@adventuretampa.com.